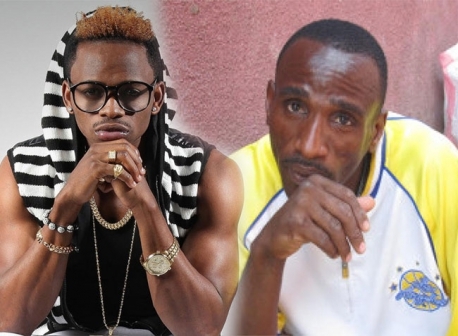 Diamond Platnumz’ father, Mzee Abdul Juma was featured in a song by three upcoming artistes. Well, he didn’t disappoint but what fans have kept talking about is the lady that gets down on him in that video. Recently, Mzee Juma has been exchanging harsh words with his daughter and singer Queen Darleen. I was chilling with my boyfriend and then somebody sent me his song. When I saw it, I laughed so hard. Right now, my head aches because of the laughter. He had angered me but I still laughed. You know there are things going on between me and my dad. When I saw it, I laughed for almost two hours. My boyfriend told me to just stop watching. No I don’t have plans for my dad. Well, Mzee Juma’s ex-wife and mother to Diamond Platnumz, Bi Sanura Sandrah aka Mama Dangote, has reacted to the song saying that she always knew he was a superstar. He has killed it. I’ve saved him as ‘Superstar’ he used to sing and really loved Hindu songs. Its not his song, he has been featured in it but he has tried. Mzee Abdul continues to deal with his knee problem, after exposing his son saying he is not helping him financially to settle medical bills.